Ursula Yovich always wanted to sing. And deep down she knew that one day she would: “After all my people have been doing it for 40,000 years”, she laughs, “it’s part of who we are”. 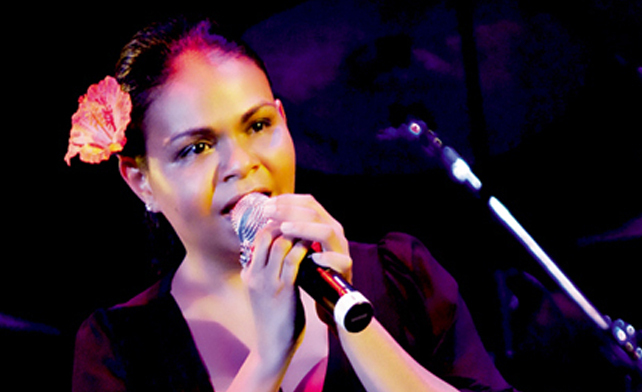 An artist and a performer with immense connections to country and family (from both her Aboriginal mother and her Serbian father) Ursula Yovich has a history of performance both as an actress and a singer. With over 12 years in the theatre industry Ursula has performed in a range of roles from Wesley Enoch’s The Sunshine Club to Capricornia and The Sapphires as well as screen credits in Australia and the Wizard of Oz. But it was the decision to sing the blues that has really catapulted this talented woman into the music world. A choice she says that was in some ways made for her as much as she chose it herself. By having her own totem and skin name Ursula found a way into her mother’s world and her mother’s people (who hail from Maningrida in northwest Arnhem land) and is now continuing to develop that relationship: “They [my totem and skin name] are very important because each time I get new information I feel far more connected – of course there are days when I don’t get it… but ultimately the need to know is far greater”. Family and relationship to country are of special significance to Ursula. “I really feel like it always has been inside me. I’ve never been the one to go HEY… I’m Aboriginal! but I have felt very strongly about country and family and being involved with women like Rhoda Roberts and Rachel Maza made me realize I can be really proud of who I am”. Perhaps that’s what so special about Ursula’s music. Mostly written by her and for her family her favourite song is ‘Just a Child’: “I think its lovely when you can write something for someone and then just see their reactions to it afterward. My brothers are big tough fellas and I think I got a tear out of their eyes, they were really moved”. And it’s not just her family who have been moved. Ursula’s beautiful soul stilling voice has moved grown men and women to tears as she sings her heart out: “Magpie Blues is a lot about mixed heritage and I’m glad to get so many responses, not only from Aboriginal folks but all people”. She recalls one particular patron, an Italian lady (who had a mixed ethnic background) came up to her and said “I get that. I really do. That’s my story”. Ursula Yovich is an inspirational woman with talent and spirit but most importantly she sings from a very special place – sharing a story that speaks to all Australians about what truly is important in our world today: country and family, and while they may mean very different things for different people, everybody’s story is special – and deserves to be heard. I am sharing this website with all my friends. I am aware they would like it just as much as I do.